It has been another delay here at Following Pulitzer—apologies to all of you who wish I would be more consistent (and thanks for your continued interest). As it happens, I think a transition is coming that may free up more time for me to read and to write—a job change that will mean another cross-country move like the one I blogged through in 2011—but I’ll say more about that another day. Today is a day about other people, and not me. I call it Armistice Day in the title intentionally, because sometimes I think we are too quick to forget today’s origins. It began less as a holiday to honor those who serve their country (great as that sacrifice often is, and humbling as it can be to the vast majority of us who do not serve), and more specifically as a holiday to honor the day the guns fell silent; the day a world, at long last, chose peace. It is a somber day in every country scarred by World War I except ours—a day for wreaths laid at cenotaphs and salutes to absent comrades, a day for meditative silence and serious consideration of the toll that war exacts from all who touch it. Here, I think we are often so caught up in the desire to celebrate veterans that we end up celebrating the trappings of war, thundering cannons and soaring jet engines, the flash of brightly shining medals and gun barrels as men and women in dress uniform march out at halftime or before the anthem. It makes me uneasy. As much as I honor those who serve, and know that there have been dark moments in the world’s history where, without that service, much that is good would have been lost… it is hard to see all that pomp and wonder if it dulls us to the cost of war. Certainly my generation easily remembers how blindly and foolishly we were led into conflict—a conflict that was easy for many to support because our families would not supply the lives it took to do whatever it was we did in the Middle East. Flags and salutes once a year (or twice, really, with Memorial Day) feels like cheap grace to me—an annual payment that costs people like me very little, much less than it would cost us to face the reality of the sacrifices we have demanded, and often unwisely. Much less than it would cost us to find a way of diminishing the chances that any young person will have to make those sacrifices next year, next decade, and beyond. W. B. Yeats called Rupert “the handsomest young man in England”…and it’s not hard to see why. Returning, as I am semi-regularly, to poetry in connection with the 100th anniversary of World War I—an anniversary that does not loom large enough in our popular culture right now (at least, I think we could learn a lot from reflecting on it, and we seem not to be)—coming to Rupert Brooke was more or less a necessity. The first WWI poet I ever featured on the blog (a poem posted for Veterans Day 2009), Brooke is the archetype of the World War I poet—a bright young thing, sent off to war with glorious notions about valor and duty, writing a few beautiful poems that express some deep truths about his experience and then dying a tragic young death in some gas-filled trench. Except that almost none of that is true of Rupert Brooke, who lives in the imagination (when he is remembered) a life he didn’t exactly live in real life. Today I want to reflect on a lovely sonnet by Brooke but also to consider how myth and truth come together to form images that our society will accept. First, then, a quick reality check about Brooke—he’s usually talked about as though he was one of the many teenagers rushing off to war, a perception made easier by the fact that his poetry (for all its charms) comes across as a bit naive, the sort of thing a man might write before his twentieth birthday. 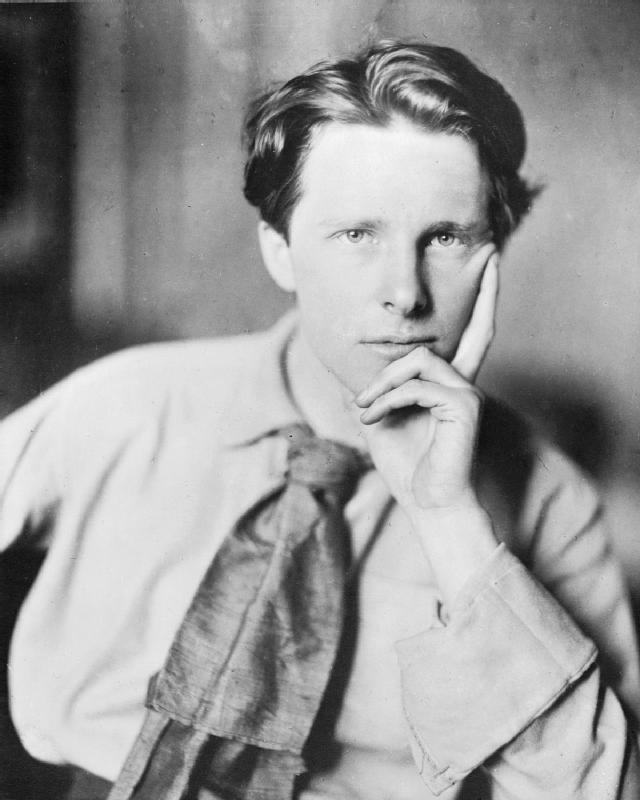 But the Rupert Brooke who headed off to the Great War was in his mid-twenties, an associate of a very “adult” and artsy crowd in Bloomsbury. Lytton Strachey was a romantic rival of his, at one point, and while at university Brooke once went skinny-dipping with Virginia Woolf; Brooke was a man of the world by the time the war came, possibly a father of a child born to a Tahitian woman who had known him during his travels in the South Seas. The glory, valor, and duty part? Oh yes, we can give him that. But we can’t fill in the rest of the story—unlike many other famous poets of the war (Siegfried Sassoon, Wilfred Owen, etc. ), Brooke does not become disenchanted with those starry-eyed ideals once he encounters the blood and darkness of combat in the trenches. He will not, in fact, see any meaningful combat at all—no trench will color his writing about the war, and his death (untimely though it was, and tragic) occurs far from the battlefield, as Brooke perishes of a mosquito-borne infection in a hospital ship in the Greek islands. He will be buried there in haste before his regiment moves on to the assault on Gallipoli: I wonder what the sweet, golden verse of Brooke would have made of that living nightmare. We will never know. So again, Brooke wasn’t the ideal “World War One poet” as far as his biography goes. But the verse he left behind is more than worthy of remembering, and here at the beginning of September, with the trenches (for the most part) not yet dug in the fields of France in 1914, I think it’s time to give him the floor again. This is one of the five poems in a series of sonnets he entitled “1914” and wrote sometime in the autumn of that year—two of the sonnets, oddly, have the same subtitle, “The Dead”. This is the latter of them, the fourth sonnet in the cycle of five, and I think perhaps his best work. Brooke composes a sonnet in praise of the war dead that, as I suggested earlier, is free of any of the realities of modern warfare. But it is undeniably beautiful, and I think there are truths here to grapple with regardless. Look at those almost effortless opening lines—presenting the dead to us as though carving them in monument. The dead are strangely alive in Brooke’s hands—marvelous in sorrow, swift to laugh. He comforts us by weaving an image of life that makes death bashful to show its face. For who can dwell on the awfulness of death in the face of this joy? Time itself is a kindness to all who have had the gift of life. Each human shares in the possession of light and life that beams in on us from the sky and erupts around us from the fertile ground. Each moment of their living is something to wonder at, for Brooke—that there should be music to hear, sleep to comfort ourselves with, friends to cheer us, somehow all of it is amazing to him, and therefore by extension to us. He executes the turn then, with the last half of the eighth line, “all this is ended”, and it is so abrupt and unexpected, we think we see where the sestet will go—the sonnet is turning from life to death, we feel instinctively, and brace ourselves for it. But there is a pause and a rush of air and we find something else. The commotion of human life is ended, but Brooke seizes on that, not to lament, but to pull backwards and appreciate this immense, vibrant space in which this life took place. Humans are entirely absent from this second half of the sonnet: instead, the light and laughter have moved on from human contexts and into the waters and winds. The frost freezes them in appreciation of the magic of the dance, holding immobile, at least for the moment, water in the midst of the wind. What else he does, as winter approaches, is to leave something else incredible “under the night”, some physical presence that Brooke sees as peaceful and glorious and overflowing with light. Few soldiers could have written this even several months later; truthfully, Brooke could hardly have written it himself past mid-1915, given both the likelihood that he would have died at Gallipoli and the likelihood that a man who survived Gallipoli would be able to write something this impersonal and idealistic afterwards. But there’s something I like about it—the sense that the immense splendor of the earth compensates us in ways we can hardly calculate for injustices that we may face along the way, the reality that no human death stops wind or wave and that therefore all life does go on, even when we do not. This is a commonly anthologized poem and it’s not hard to see why. To the extent that this obscures the grim reality of war, and makes it seem so noble and significant that it encourages our politicians to be cavalier about conflict, I’ll criticize the poem. But tonight it’s more important for me to appreciate it—to step back and ask myself where I can draw joy from unexpected places in my life, and how moving out away from human cares can provide real clarity about how to care more effectively. Whether it calls you to that or not, I hope it engages with you, on some level, and provides insight into our place in a lively and busy world. So it comes—a century ago, now, Germany, claiming that necessity and self-defense alone drove them to such a dire strait, invades neutral Belgium en route to the fields of northern France, and the nations of the earth are almost all drawn in with them to a worldwide conflict. We might be tempted to think that, 100 years later, we are wiser somehow—that we would not be susceptible to the same mistakes and irresistible urges. But there is always a new nation to claim its hand is forced—to see in the eyes of its neighbors only threat and not the possibility of peace—and a new population of innocents to be trampled by the machinery of war as one army races over them to find the foe beyond. Much as I think the Germans can fairly be blamed for a lot of the factors that led to the Great War, France cannot be set aside as innocent in the coming of that conflict, or the rest of the Great Powers of Europe, for that matter. But the people of Belgium, especially the folk of its little villages and fields whose only sin was a desire to remain in their home and to defend it against any who would try to harm them—their innocence is unchallengeable, I think, and so those who died in the Flemish fields deserve a special remembrance. A little hill of hay your spur has scattered. . . .
Chesterton is never a subtle writer, which can limit the effectiveness of much of his poetry, but here I think it works for him, both because the subject calls for bold strokes and because, under the circumstances, the blunt and direct voice of the speaker is perfectly consistent with how that woman in that moment might talk to someone else. You can hear the crack in her voice from the beginning, the sad, wry observation that this army before her is a lost one—lost in the technical sense that her little Flemish town is not “on the way to Paris” by any real stretch of the map, and lost in the much more profound moral sense that, in seeking to do battle with their true foe, they have stained themselves with killing they can never wash clean. The German before her, seemingly sent to seize property or gold or supplies from her farm as spoils of war, has some decency—he looks down at his sword, he is perhaps ashamed of himself, or at least embarrassed by this woman’s fearlessness in challenging him. But decency is not enough to suit the occasion. What, she asks, is Germany’s due in all this—what did she and her family, smaller today than it was not long ago, owe them? Is Germany really going to plunder Belgium for materials and supplies, in addition to slaughtering her youth? She reduces that vast scale of plunder to the personal and gut-wrenching, the notion that she is being forced to pay them a penny at swordpoint, as though she owes one coin for each murdered son. And then she turns the tables again, since we expect her to say that nothing could ever repay HER for the loss of her sons, but instead she tells the German that nothing will ever be able to repay HIM for what he has lost by killing. Chesterton lets her speak directly to the soldier’s inmost being, the soul that now carries a burden it cannot unload, the heart that will be heavier forever. And she breaks that sentiment over him again and again, like the waves of a fathomless ocean, repeating incessantly that nothing she can give will free him from the chains he made for himself, that no amount of largesse will wipe out the memory of what these conquering boots have shattered. Even her forgiveness—a gift so substantial and unlooked-for that we almost cannot imagine her extending it, and yet she raises it as a possibility—would not be enough to give the German soldier back what he threw away so heedlessly. She will not bargain with him, not spend another word in castigating him for his sins or absolving him in impossible mercy. There is no man left, she suggests, to deal with—“no word to break: no heart to harden”, she tells him, nothing to hurt or heal or help. There is a bitter laugh in that last line, as she says “ride on and prosper”, because she’s already made it clear in every possible way that he will never find peace again. Some violations cannot be undone; some cuts go too deep. I don’t want to suggest that the Wife of Flanders (and/or Chesterton, if we assume he agrees with her) has the only way of looking at this situation. I’m a great fan of mercy, myself, and forgiveness, and even in such terrible times I think they can hold immense power. But she’s right to cast things as she does, I think—to argue that she has only lost the lives of those she loves, precious and priceless as they are. The German soldier, standing before her, has lost something about himself that is even more terrible to lose, and more devastating to live with. That poisonous effect of violence, working its way insidiously into everything about us, is what the 20th Century’s best minds grappled with. There’s a reason men like Gandhi and Dr. King rejected violence even in the service of a good cause: they understood what it did to a person, how it malformed and scarred them, even under the best of circumstances. As Joshua learns in WarGames, when it comes to war between the nations, the only winning move is not to play. That’s not to say I think all soldiers naturally bear the scars the Wife of Flanders describes—obviously there are particular realities about Germany’s conduct in Belgium that made German soldiers particularly responsible for something particularly reprehensible. But we cannot be too careful in what we choose to do, or endorse, as nations inch towards war—war leaves no one unharmed or unstained. We have to remember the terrible price even the victor carries away from the field. I’ll be looking at the works of some excellent Great War poet soldiers in the weeks ahead, because their perspective is key also, and tells us about a side of life the Wife of Flanders cannot give to us. But I thought starting first with the civilian perspective was the right thing to do, and it’s her voice that I want with me as I look at war, both in the past and in this present hour, to ask what it costs, and who will pay that cost. I’m immersing myself in the violent world of a century ago—reading Barbara Tuchman’s The Guns of August about the summer of 1914 when the world sped headlong into war, reading Upton Sinclair’s Dragon’s Teeth (Yes, gentle reader! There will be a Pulitzer novel update post soon!) which, despite its setting in 1930, is very much consumed with the question of what led to the Great War of 1914-1918 and what it meant—and then of course at the same time, because I am alive and human and I want to learn about what it means to be those things, I am reading news online about the violent world around me, both close to home and far from it. The death of passengers in a Malaysian airplane, the death of so many, including so many innocents, in the Middle East as Gaza erupts in blood, and the deaths of young people on the streets of Chicago in the violence that each summer brings and we seem unable to diminish, despite our efforts (I will not call them “best”: I don’t think we’ve given an effort worthy of that adjective yet). And Friday comes and I’m supposed to select a poem that says something about something. I’ve been looking at the poetry of 1914. A lot of it is from August and later, the world changed by war, and I’ll get to them. Many of them are exquisitely moving. But for now I’m thinking of exactly a century ago, as the peoples of Europe held their breath in the long July that stretched between Ferdinand’s death in Sarajevo and the German army’s assault through the Low Countries. So I don’t want to use the poems of war yet, and then on the other hand all these things on my mind make it hard for me to take the easy way out and pick up a short poem from one of Robert Frost’s collections, say, that appeared in 1914. So you get “Poem of the End”. “Poem of the End” appeared in 1914, or so my sources claim—some say it came out in 1913, but in either case I think it captures the mood I’m grappling with, and the tension of that Europe just before the war began. It’s the work of a Russian poet named Vasilisk Gnedov, a futurist and experimental poet who pushed a lot of boundaries. He published a collection entitled Death to Art, a series of poems that get progressively shorter and shorter. You’re probably wondering by now why I’m blathering on about this when I normally just give you the text of the poem. Well, the last poem in Death to Art is simply the title, “Poem of the End”, and a blank page. If this reminds you of other famous works—maybe music lovers will especially think of John Cage’s 4’33”—I think that’s fair. But I think there’s also something distinctive about this work. When Gnedov performed it, supposedly he would simply walk on stage, announce the title, make a gesture with his hand, pause for some length of time, and then sit down. Different observers recorded the gesture differently, so it’s not clear to me if the gesture was intended to be difficult to interpret, or if Gnedov simply changed it for different performances. Each description makes it sound somewhat violent—a hand thrust suddenly up over the face and then dashed away from it, or a hand making a slashing motion first one way and then another, etc.—and deliberate. This may be silly poetic posturing, of course, the kind of performance art that gets mocked more than it ever actually gets undertaken by a performance artist. You may think it very silly for me to offer it to you today, and I may be. But something about “Poem of the End” spoke to me tonight. If I may attempt to interpret Gnedov, or at least to make him speak to how I feel today and how the world looks, both in his time of 1914 and ours of 2014, here’s what I see. I see a poet acknowledging that there is a boundary to what our words can encompass and address. There is a threshold beyond which it’s hard to see what art can do, other than to stand before us in silence and ask us to examine what is left when the words fall away. A quiet man, poised on a stage, moves with suddenness and then nothing follows—we expect to be given some meaning to engage with, and instead find ourselves left with only our thoughts and the context around us that we’ve been ignoring in order to attend to our art. Is it cheeky to print a blank “Poem of the End”? Of course it is. But what other poem will suffice to show us what an ending means? I hope that the world is full of more beginnings tonight than endings, of more hope than despair. But there is no denying that these past days and weeks have seen too many voices silenced forever, unfairly and before their time. Gnedov offers us this gift tonight—a space without words into which perhaps those voices can speak. May we listen well. Tomorrow marks a century since the Yugoslavian nationalist Gavrilo Princip fatally shot Archduke Ferdinand and his wife, Sophie—the violent act was precipitated by Austria’s long occupation of the Slavic territories surrounding Serbia, and of course it then precipitated the maneuvering of the Powers of Europe until, in August, the guns rang out and what they then called The Great War (and what we would, many years later, call World War I) commenced. The shadow of that war still hangs over us—World War II and all its aftermath are really dominos toppling in a chain leading back to the Triple Entente and the Triple Alliance, to Versailles and the carving up of the world. Today, in Iraq, ISIS and the Kurds and the Maliki-led military forces are clashing over a fictional idea that was created by World War I, namely the idea that Iraq, a melange of faiths and ethnicities and national peoples, is a single country that can be ruled by a single government. Like Kevin Bacon, the Great War unifies all 20th and 21st Century conflicts—it’s hard to point to any war since then that is not connected, usually in only one or two moves, to what began in the streets of Sarajevo on the 28th of June. As we go through the next few years of 100th anniversaries of key moments in that conflict, I know I’ll reflect from time to time on the poetry of that war. 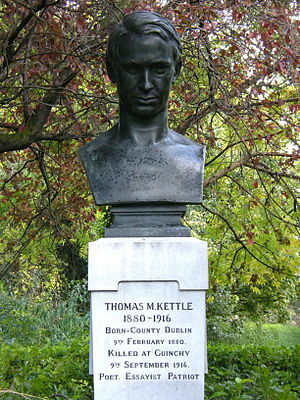 Most of the Pulitzers I’ve reviewed so far have been impacted in some way by WWI, and some have been explicitly interested in it (His Family and One of Ours, especially). My current Pulitzer novel deals with families forged in that war. So reflections on it, and on what the writers at the time made of it, are part and parcel of the long ongoing project here in which I try to make sense of my nation and its art. Hardy begins where this tale will inevitably end—in the grave, among the dead, who are the nameless collective first person throughout this poem. They are uneasy in their rest because of the thundering cannons that echo through the churchyard, the sound of naval gunnery practice as Great Britain’s dreadnoughts prepare for the war that is to come. All nature is disturbed, it seems—the images in the second stanza are of a world knocked a little from its moorings, insecure. God’s sudden appearance is strange for anyone who knows Hardy: his cynical atheism is at the heart of a lot of his work, and I’ve even explored it a little in a previous Poetry Friday post. But the cynicism remains even with the arrival of the Deity. He reassures the dead that it’s not the last trumpet—only the thudding of guns. A line like “the world is as it used to be” is in one sense soothing, but of course in context it’s also deeply depressing: the dead are being consoled by the simple fact that war and killing remain a major human preoccupation. I’ll admit, I think the central portion of the poem is weakest for me—the attitude is too easy, too predictable, as God deplores the waste of all this energy on blood and death, and suggests that these folks are lucky it isn’t the Second Coming, since they’d all be doing hard time in Hell for their sins (although why God thinks any delay will change that, under the circumstances, isn’t really clear). I do like the dryness of God’s laugh “Ha, ha”, not a giggle or a chortle but that flat, open-mouthed laugh that blasts out of you when you can hardly believe what you’re seeing. It’s a rueful laugh, and it’s followed by a much sharper observation than the previous stanzas—that humanity is in such dire need of “rest eternal” that God’s considering just not waking anybody up, ever, and dispensing with this whole “glorious return” and “renewing of the earth” business that prophecy associates with the judgment day. And the poem continues to improve, for me, after God’s exit: one of the dead, very naturally, asks if any of the centuries to come will bring a more peaceful era in human history, a better time than the days these sleeping souls once knew. The bones rattle as the corpses demur—no, they suggest, humanity is on some level unimproveable. The dead parson laments wasting his time on those sermons, the fruitless words cast out like seeds on rocky soil, doomed not to take root. Better, he thinks, to have spent his days in a little private pleasure, a little smoke and alcohol to while away this mortal life. And then that last great stanza as though the camera pulls suddenly back—no, “pulls” isn’t violent enough a word, the camera shoots backward like a fired munition—as we watch the thunder of the gunfire echo inland to Stourton Tower (associated with the “first” English king, Alfred the Great), then Camelot (deeper into the mythic past, and the legendary Arthur), and lastly to that monument under the starlight, the mute trilithons of Stonehenge. Peering farther and farther back in time, Hardy finally quiets down: he shows rather than tells us that we cannot see back far enough to an age before war, and implicitly invites us to imagine the long, bloody road ahead. Channel Firing is not the most moving of the Great War’s poems, in part because it is written before the war itself begins. Hardy cannot yet know or draw on the agony of the trenches, the mad waste of a generation mowed down by machine guns and clouds of mustard gas. And because it’s grounded in Hardy’s trademark depression, it does seem to weigh us down with its burdens—there is no suggestion that war can be averted, or that humans have any real role to play other than as pawns in this never-ending cycle. But I see it as valuable, in part because I think it challenges me to argue with the poem, to suggest that there is a side to humanity it does not see. And in part because I think it reminds me how real these truths are about the human condition, that to fight and die is deeply ingrained in us, and that it will take more than kind intentions and a pledge not to forget to get us off of this course we’re on. The men and women who survived this war swore it would be the last such conflagration. They sent their children to die, again, 25 years later. I don’t think we should be fatalistic, but Hardy demands that I be realistic—when the dead hear the guns again, they will need to hear a better argument than I yet have, if I’m going to convince them that, this time, the cycle will be broken.